We congratulate the friends of truth and order on the appearance of these publications. We have never had any doubt what would be the decision of the public mind respecting the new divinity and new-measure system of our day, if its distinctive features could be brought out to the light and exposed to general observation. History warrants us in cherishing this our confidence. The truth is, that this system contains but little that is new. It is mainly, if not entirely, composed of exploded errors and condemned heresies. The church has already once and again pronounced judgment upon it; and we have no doubt therefore, that the same sentence of condemnation will be repeated by the Presbyterian church of the present day, whenever the case is fairly presented for decision. The chief reason why the condemnation of this system has at all lingered, is that its true character has not been generally known. Its advocates, when charged with teaching certain obnoxious doctrines, and, in their religious meetings, violating the sobrieties of good sense as well as of Christian order, have evaded or denied the charge, and complained piteously of misrepresentation. Much has been done to blind the minds of those who were not able to bear the things they had to say, to the undisguised character of the doctrines they have taught in the lecture room and the chapel. We rejoice, therefore, in the publication of Mr. Finney’s sermons and lectures. The public can now learn what the new system is, from the exposition of one of its chief promoters. He has stated his own case, and out of his own mouth may he now be justified or condemned. The lectures on revivals were delivered by Mr. Finney to his congregation in Chatham Street Chapel, during the last winter. They were first published from week to week, in the columns of the New York Evangelist, from reports furnished by the editor of that paper. They were subsequently collected, and after having been submitted to the author for correction, published in a volume. The work, we perceive, has already reached a fifth edition. Much diligence is employed in efforts to give it an extended circulation. It is recommended as a suitable book for Sabbath school libraries; and no pains are spared to spread it abroad through the length and breadth of the land. Its friends evidently have a strong persuasion of its extraordinary merits. Their zeal for its circulation proves that they consider it a fair and able exposition of the new system. The sermons appear to be a monthly publication. We have obtained seven of them, which are all, we presume, that have yet been published. They discuss the several topics, ‘Sinners bound to change their own hearts,’ ‘How to change your heart,’ ‘Traditions of the Elders,’ ‘Total Depravity,’ ‘Why Sinners hate God,’ and, ‘God cannot please Sinners.’ These sermons, with the lectures on revivals, give a pretty full exhibition of Mr. Finney’s peculiar views. If we may judge from the tiresome degree of repetition in these productions, the perpetual recurrence of the same ideas, phrases, and illustrations, we should suppose that he can have nothing new to say; nothing, at all events, that would materially add to, or modify, what he has already said. We may consider ourselves fairly in possession of his system. To the interpretation of that system we shall now proceed, having it less for our object to refute, than merely to exhibit its peculiarities. We shall endeavor to gather up the plain, obvious meaning of Mr. Finney’s statements, taking it for granted, that there is no hidden, esoteric sense attached to them. Of the literary merit of these productions we have but little to say. The reporter deprecates, or rather defies all criticism upon their style, affirming that the critic ‘will undoubtedly lose his labour.’ No doubt he will, so far as the amendment of the author is concerned. But the reformation of an offending author is not the sole object of criticism. The reporter himself (the Rev. Mr. Leavitt) says of Mr. Finney’s language, that it is ‘colloquial and Saxon.’ Words are but relative in their meaning. What kind of ‘colloquies’ the Rev. Mr. Leavitt may have been used to, we do not pretend to know; but for ourselves we must say, that we desire never to have a part, either as speakers or hearers, in any colloquy where such language is current, as Mr. Finney often permits himself to employ. If his other epithet, Saxon, means simply, not English, we have no objection to it. For, surely it has not often fallen to our lot to read a book, in which the proprieties of grammar as well as the decencies of taste were so often and so needlessly violated; and in which so much that may not inappropriately be termed slang was introduced. But we have higher objects before us than detailed criticism upon Mr. Finney’s style. We should not have made any allusion to it, but that we deemed it worth a passing notice, as forming part and parcel of the coarse, radical spirit of the whole system. We proceed to examine, in the first place, the doctrines of this new system. Mr. Finney does not pretend to teach a slightly modified form of old doctrine. He is far from claiming substantial agreement with the wise and good among the orthodox of the past and present generation. On the contrary, there is a very peculiar self-isolation about him. Through all his writings there is found an ill concealed claim to be considered as one called and anointed of God, to do a singular and great work. There is scarcely a recognition of any fellow-laborers in the same field with him. One might suppose indeed, that he considered himself the residuary legatee of all the prophetic and apostolical authority that has ever been in the world, so arrogantly does he assume all knowledge to himself, so loftily does he arraign and rebuke all other ministers of the gospel. He stands alone in the midst of abounding degeneracy, the only one who has not bowed the knee to Baal. The whole world is wrong, and he proposes to set them right. Ministers and professors of religion have hitherto been ignorant what truths should be taught to promote revivals of religion, and he offers to impart to them infallible information. It is true, in his preface, he disclaims all pretensions to infallibility; but in his lectures, he more than once substantially assumes it. He tells his hearers, in relation to promoting revivals, ‘If you will go on to do as I say, the results will be just as certain as they are when the farmer breaks up a fallow field, and mellows it, and sows his grain.’ He speaks repeatedly of the ‘endless train of fooleries,’ the ‘absurdities,’ the ‘nonsense,’ which, up to his time, have been taught both in private and from the pulpit. He declares, ‘there is only here and there a minister who knows how to probe the church,’ etc. ‘This is a point where almost all ministers fail.’ ‘When I entered the ministry so much had been said about the doctrine of election and sovereignty, that I found it was the universal hiding place, both of sinners and the church, that they could not do anything, or could not obey the gospel. And wherever I went, I found it necessary to demolish these refuges of lies.’ ‘There is and has been for ages, a striking defect in exhibiting this most important subject.’ ‘For many centuries but little of the real gospel has been preached.’ ‘The truth is, that very little of the gospel has come out upon the world, for these hundreds of years, without being clogged and obscured by false theology.’ What can be more evident than that Mr. Finney considers himself a great reformer? He comes forth with the avowed purpose of clearing away the errors by which the true gospel has been so overlaid as to destroy its efficiency. He comes to declare new truths, as well as to unfold new methods of presenting them to the mind. The first of these new doctrines to which we call the attention of our readers, has relation to the government of God. It will be remembered that a few years since, Dr. Taylor, with some other divines, publicly announced and defended the proposition, that God could not prevent the introduction of sin in a moral system. At least he was very generally, if not universally, understood to teach this proposition. And it is strange, if not actually unprecedented, that a writer of an honest and sound mind, understanding the language he employs, and having it for his serious purpose to convey to his readers certain important information, should be misunderstood as to the main purport of his message by those best qualified, from education and otherwise, to comprehend it. But Dr. Taylor did complain that he was misunderstood. He insisted that he did not intend to teach that God could not prevent the existence of moral evil, but only that it is impossible to prove that he could prevent it. His object was to unsettle belief in all existing theories upon this subject, and then to substitute this negative one in their place; in other words, to inculcate absolute scepticism upon this point. This is the ground now occupied by the New Haven divines. We fear, therefore, that they will be alarmed by the position which Mr. Finney has taken. He has evidently neglected, since his return from his foreign tour, to post up his knowledge. He has not acquainted himself with the improvements made during his absence. He teaches, without any qualification, the doctrine which the New Haven school was at first understood to teach. He complains that sinners ‘take it for granted that the two governments which God exercises over the universe, moral and providential, might have been so administered as to have produced universal holiness throughout the universe.’ This, he says, is a ‘gratuitous and wicked assumption.’ It is wicked, then, to believe that God could have produced universal holiness. We see not the least ground for this distinction between the moral and physical power of God; nor do we believe that Mr. Finney himself can attach any definite meaning to his favorite phrase, ‘physical omnipotence.’ By the omnipotence of God we understand a power to do anything without those hindrances and restrictions by which we and all created beings are beset. It must be the same power which sways the intellectual and physical universe, unless we are to make as many different species of power as there are objects upon which it may be exerted. This distinction, however, were it well founded, would avail Mr. Finney nothing in defence of his position. The power of God, by whatever name called, can be limited in its exercise only by the laws which he has himself immutably fixed. The power of the Creator was without any limit; the power of the Governor labors under no other restrictions than the ordinances of the Creator have imposed upon it. It is often said that God cannot achieve impossibilities, such as to make a body exist in several places at the same time. All such limitations of the divine power are found in those relations and properties of things which he has himself established. A body cannot be made to exists in several places at once, for if it could it would no longer be a body. So in the nature of man we may trace certain properties and laws, which lay a similar restriction, if so it may be called, upon the exercise of the divine power. God cannot make a sinner happy, while he continues a sinner, for he has already so made man that his happiness must come to him as the consequence of the right action of his powers, and he would cease to be man if this law of his nature were altered. Now is there any similar restriction in the nature of moral agency? Does it enter into our notion of a moral agent, and go to make up the definition of one, that he cannot be subjected to any other influence than of motive? Suppose that God should, in some inscrutable way, so act upon his will as to dispose it to yield to the influence of motive, would such action make him cease to be a moral agent? If not, we have no right to deny the power of God to effect it. It is impossible to conceive that his power can be restrained by anything exterior to himself. The only bounds beyond which it cannot pass must be those that have been established by his own nature, or his previous acts. Unless he has so made moral agents that it is a contradiction in terms to assert that they can be influenced in any other way than by motive, it is in the highest degree unwarrantable and presumptuous to deny that God can act upon them by other means. But a moral agent, while possessed of the necessary faculties, and not forced to act contrary to his will, or to will contrary to his prevailing inclinations and desires, remains a moral agent still. Would, then, the operation of any other influence than that of motive upon him, destroy his liberty of action or his freedom of will? Certainly not. And as certainly no man can deny that God can influence men as he pleases without thereby denying his omnipotence. A more groundless, gratuitous assumption could not well be found, than Mr. Finney has made in asserting that it is impossible for God to affect his moral subjects in any other way than by motive. Let it be observed that we use the word motive, as Mr. Finney himself has evidently used it, to denote simply the objective considerations presented to the mind as they are in themselves, without taking into account the state of the mind in relation to those considerations. This is the only sense of the word in which it can be at all maintained that ‘infinite motives’ have been urged upon man for the prevention of sin and the promotion of holy obedience. If the state of the mind, which always determines the apparent qualities of the object, be included, as it generally is, in the term motive, then it is not true that the mind could resist ‘infinite motives.’ In this sense of the word it is self-evident that the will must always be determined by the strongest motive. An ‘infinite motive,’ by which can be meant only a motive infinitely strong, or stronger than any other we can conceive of, would of course prevail and carry the will with it. Then it would be just to infer, from infinite motives having been presented to bear man onward in the paths of holy obedience, that God had done all that he could to prevent sin. And then too it would be impossible that any sin could exist, or that sin could ever have entered our world. But granting, what we have shown to be the gratuitous assumption, that God cannot influence men in any other way than by the objective presentation of truth to the mind, Mr. Finney has given us no reasons for adopting the opinion that, ‘He has done all that the nature of the case admitted to prevent the existence of sin,’ while we can see many reasons which forbid us to receive it. The state of the question, as we are now about to put it, in conformity with Mr. Finney’s representation, does indeed involve the three gratuitous assumptions, that God could not have made man a moral agent and yet give him a greater degree of susceptibility of impression from the truth than he now possesses; that man being as he is, God could not have devised any external considerations to affect him, in addition to those which are actually placed before his mind; and lastly, that man and the truth both being as they are, God cannot reach and move the mind of man in any other way than by the truth. These are by no means axioms, and Mr. Finney would be sadly perplexed in the attempt to prove any one of them. But, for the sake of showing that even with these bold and barefaced assumptions he cannot maintain the position, we will admit them all. Man could not have been a moral agent had he been more yielding to the truth than he now is. ‘Infinite motives’ to obedience have been provided; by which, as we have already shown, can be meant only that all the truth which could possibly affect the human mind has been revealed to it. And thirdly, man cannot be moved but by the truth. The ‘nature of the case’ being supposed to demand all these admission, does it still follow that God has done all that he could to prevent the existence of sin? Mr. Finney himself shall answer this question. His theory of the nature of divine influence is, that the Spirit ‘gets and keeps the attention of the mind,’ ‘He pours the expostulation (of the preacher) home’, He keeps the truth, which would else have been suffered to slip away, ‘in warm contact with the mind.’ Here is of course the admission, and we are glad he is willing to concede so much power to his Maker, that God can gain the attention of the mind, and keep before it and in contact with it, any or all of the ‘infinite motives’ which he has provided to deter from sin. Connect this admission with another class of passages, in which Mr. Finney teaches that, ‘When an object is before the mind, the corresponding emotion will rise,’ and who does not see in the resulting consequence a glaring inconsistency with the doctrine that God has done all that he can to prevent the existence of sin? To make this more plain, we will take the case of Adam’s transgression, of which Mr. Finney has, out of its connection with the subject we are now discussing, given us the rationale. The temptation in this case was the motive addressed to Adam’s constitutional appetites. The reason why this motive prevailed was, that it was kept before the mind to the exclusion of adverse considerations. The emotions of desire towards the forbidden fruit were not unlawful until they had become sufficiently strong to lead Adam to violate the command of his Maker. If, then, just at the point of unlawfulness, the attention of Adam’s mind had been diverted from the forbidden fruit to the consideration of God’s excellency and his command, ‘the corresponding emotion’ would have arisen, and he would not have sinned. But the Spirit has power to ‘get and keep the attention of the mind.’ Certainly then he could have directed the attention of Adam’s mind to those known truths, though at the moment unthought of, which would have excited the ‘corresponding emotions’ of reverence for God, and preserved him thus in holy obedience. But though Mr. Finney holds forth the views here given of the Spirit’s agency in presenting truth to the mind, it would evidently be a great relief to his theological scheme if he were fairly rid of the doctrine of divine influence. The influence of the Holy Spirit comes in only by the way, if we may so speak, in his account of the sinner’s regeneration and conversion. We will cast away this doctrine, therefore, — we will grant him even more than he dares to ask, and still his position is untenable, that God has done all that he can do to prevent the existence of sin. Before he can demand our assent to this proposition, he must prove, in the case already presented, that God could not have prevented the entrance of Satan into the garden. Admitting that the volitions of Satan were beyond the control of his Maker, he must investigate the relation of spirit to space, and prove that it was impossible for God to have erected physical barriers over which this mighty fiend could have passed. He must show that it was impossible for God so to have arranged merely providential circumstances, that our first parents should have been kept out of the way of the tempter, or that the force of the temptation should have been at all diminished. Until he has proved all this, and then proved that his three assumptions, which we have pointed out, are true, we must prefer the ‘absurdity’ and ‘nonsense’ of rejecting his doctrine, to the wisdom of receiving it. The argument thus far has been a direct one, and we should not fear to leave it as it now stands. But we cannot refrain from adverting to some of the consequences of the doctrine we have been examining. If God has done all that he can to prevent the existence of sin, and has not succeeded in his efforts, then must he have been disappointed. If he cannot control at pleasure the subjects of his moral kingdom, then must he be continually and unavoidably subject to grief from the failure of his plans. Instead of working all things according to his good pleasure, he can do only what the nature of the case will permit, — that is, what his creatures will allow him to do. He in whose hands are the hearts of all men, and who turns them as the rivers of waters are turned, is thus made a petitioner at the hands of his subjects for permission to execute his plans and purposes. Accordingly we find Mr.Finney using such language as this: ‘God has found it necessary to take advantage of the excitability there is in mankind, to produce powerful excitements among them before he can lead them to obey.’ He speaks of a ‘state of things, in which it is impossible for God or man to promote religion but by powerful excitements.’ And of course there may be states of things in which neither by excitements nor by any other means will God be able to effect the results he desires. Then may we rightly teach, as some at least of our modern reformers have taught, that God, thwarted in his wishes and plans by the obstinacy of the human will, is literally grieved by the perverse conduct of men; and sinners may properly be exhorted as they have been to forsake their sins from compassion for their suffering maker! It is a sufficient condemnation of any doctrine that it leads by an immediate and direct inference to so appalling a result as this. We know of nothing which ought more deeply to pain and shock the pious mind. If the perverseness of man has been able in one instance to prevent God from accomplishing what he preferred, then may it in any instance obstruct the working of his preferences. Where then, is the infinite and immutable blessedness of the Deity? We cannot contemplate this doctrine, thus carried out into its lawful consequences, without unspeakable horror and dismay. The blessedness of the Deity! What pious mind has not been accustomed to find in it the chief source of its own joy? Who does not habitually turn from the disquieting troubles and scenes of misery that distress him here, to ‘drink of the river of God’s pleasures? !’ Who can bear the thought that the infinitely holy and benevolent God should be less than infinitely happy? We see not how any heart that loves God can feel happy itself, unless it believes him to be, as he deserves to be, infinitely blessed. Nor can we find any security for the felicity of the creature but in the perfect and unchangeable felicity of the Creator. If God, therefore, is as this doctrine represents him, unable to produce states of things which he prefers, and if his benevolent feelings are thus continually exposed to grief from obstructions to their operation, the voice of wailing and despair should break forth from all his moral subjects. We can see, indeed, but little to decide our choice between such a God as this and no God. Another consequence of this doctrine is that God cannot confirm angels and saints in holiness. If he could not prevent the introduction of sin into our world, we see not upon what principles we are entitled to affirm that he can prevent its re-introduction into heaven. We see not how he can at any time hinder that standard of rebellion from being yet once more uplifted among the bright and joyous throng that now cast their crowns at his feet. We are perfectly aware of the answer which Mr. Finney will make to this objection. He will contend that the additional motives furnished by the introduction of sin, such as the visible and dreadful punishment of the sinner, and the display of the divine character thereby afforded, are sufficient to enable God by the use of them, together with the means and appliances previously existing, to confirm holy beings in holiness. Now, independently of other insuperable objections to this as a sufficient reply, how does it consist with that other part of the scheme, that ‘infinite motives’ had been already arrayed against the introduction of sin? If these motives were infinite, then no addition could possibly be made to them. We leave Mr. Finney to reconcile this contradiction, or to admit that we have no reason to expect that the gates of heaven will be barred against sin. This doctrine also takes away from the sinner all just ground for the dread of everlasting punishment. Its advocates, we know, have contended that it is the only position from which Universalism can be effectively assailed. But if, when man was tempted to sin by so insignificant a motive as the forbidden fruit, while ‘infinite motives’ were drawing him back, God could not prevent him from yielding, it must surely be impossible for him to prevent the sinner in the other world from obeying the impluse of infinite motives which, more strongly there than here, will urge him to holiness. The sinner, then, may dismiss his apprehensions of the everlasting experience of the miseries of a wicked heart. If God could not prevent Adam from sinning, under the influence of a small motive, there is no reason to fear that he can prevent any inhabitant of hell from becoming holy, under the influence of infinite motives. We have dwelt upon this subject at greater length than was at first intended. Our excuse is, that the question at issue is a very serious and important one, and the views of it presented by Mr. Finney seem to be so dishonoring to the character of God, as well as subversive of some of the most important truths of religion, that they should be carefully examined. Had our object been simply to criticize, Mr. Finney might have been more briefly despatched. There is in his pages a surpassingly rich treasure of contradictions, which might at every turn have furnished us with an argumentum ad hominem, had we been disposed to avail ourselves of it. But we have felt that the matter in hand was of too grave and weighty an import to be thus managed. Our readers will soon be able to judge for themselves whether Mr. Finney has cleared away any of the darkness which rests upon this subject. In the prosecution of our inquiries into the nature of sin, two questions very naturally present themselves for decision; first, whether there can exist anything like what has been called disposition, distinct from mental acts; and secondly, whether, if such an attribute of mind can and does exist, it may be said to possess any moral character. Mr. Finney, with much convulsive violence of language, continually denies that there can be any such thing as a mental disposition, in the sense in which we have used the word. He employs the term, it is true, but he says he means by it a mental act, and that it is nonsensical to attach to it any other meaning. His arguments against the possibility of the existence of mental dispositions, apart from mental acts, may be briefly dispatched; for we do not reckon among the arguments his violent outcries of darkness, confusion, absurdity, nonsense, doctrine of devils, etc., nor his assertions that God himself cannot lead the sinner to repentance without first dispossessing him of the erroneous notion that his nature as well as his conduct needs to be changed. All the arguments on the point now before us, that lie scattered through his many pages, may be reduced to two. It is impossible, he contends, to conceive of the existence of a disposition of mind; and again, if there be a disposition distinct from the faculties and acts of the mind, it must form a part of the substance of the mind, and hence follow physical depravity and physical regeneration with all their horrid train of evils. When he asserts the impossibility of conceiving of a disposition of mind, we suppose he means that it is impossible to frame an image of it, or form a picture in which this disposition shall stand visible to the mind’s eye. It is only in this sense that his assertion is true. It is true that we cannot form such a conception of a mental disposition, but we will not insult the common sense of our readers by attempting to prove that this is no argument against its existence. The other argument on which Mr. Finney relies to prove the non-existence of any disposition of mind, is that if there is any such thing it must form a part of the substance of the mind, it must be incorporated with the very substance of our being, with many other phrases of like import. Hence he charges those who teach that there are such dispositions, and that they possess a moral character, with teaching physical depravity, and representing ‘God as an infinite tyrant.’ He avers, in a great variety of forms, that their preaching has a direct and legitimate tendency to lull the sinner in his security, to make men of sense turn away in disgust from such absurd exhibitions of the Gospel, and to people hell with inhabitants. These are grave charges; and as, if substantiated, they would affect the fair fame and destroy the usefulness of nine-tenths of the ministers of the church to which Mr. Finney belongs, so, if groundless, Mr. Finney must be regarded as a slanderer of his brethren, guilty and odious in proportion to the enormity of the unsustained charges against them. In one respect at least Mr. Finney is guilty of bringing false accusations against his brethren. He continually represents them as holding and teaching all his own inferences from their doctrines. This is more than uncharitable; it is calumnious. He has a perfect right to develop the absurdities of what he calls physical depravity, and present them as so many reasons for rejecting any doctrine which can be proved to result in such consequences; but he has no right to endeavor to cast the reproach of teaching these inferred absurdities upon men who have uniformly, and if more decently yet not less strongly than himself, disclaimed them. But we contend that these absurdities do not lawfully flow from the doctrine that the mind has tastes and dispositions distinct from its faculties and acts. It is easy to show, in contradiction to Mr. Finney, that it may possess such attributes, which nevertheless will not form any part of the substance of the mind. Nay, we can make Mr. Finney himself prove it. In one of his sermons, where he has lost sight for a brief space of physical depravity, he speaks on this wise: ‘Love, when existing in the form of volition, is a simple preference of the mind for God and the things or religion to everything else. This preference may and often does exist in the mind, so entirely separate from what is termed emotion or feeling, that we may be entirely insensible to its existence. But although its existence may not be a matter of consciousness by being felt, yet its influence over our conduct will be such, as that the fact of its existence will in this way be made manifest.’ Here is a state of mind recognized, which Mr. Finney, with an utter confusion of the proprieties of language, chooses to call love existing in the form of volition, but which we call a disposition. But by whatever name or phrase it may be designated, it is not a faculty of the mind; it is not the object of consciousness, has no sensible existence, and cannot therefore in any proper sense be called an act of the mind, nor yet does it form any part of the substance of the mind. It is not without an object (what it is will be presently seen) that Mr. Finney makes so queer a use of the term volition in the above quotation; but the insertion of this word does not alter the bearing of the passage upon the point now in question. His subsequent qualifications show that he is describing something different from an act of the mind: and the single question now before us is, whether there can be in the mind any disposition distinct from its acts, and comprising within it tendencies and influences towards a certain course of action, which yet does not form a part of the substance of the mind. The passage quoted is clear and explicit, as far as this question is concerned. Let us hope, then, that we shall hear no more from Mr. Finney on the subject of physical depravity; or at least that when he next chooses to harangue his people on this favorite topic, he will have the candor, the plain, homespun honesty, to tell them that there is not a single minister in the Presbyterian church who teaches the odious doctrine, or anything that legitimately leads to it; but that he has brought this man of straw before them to show them how quickly he can demolish it. We have a great aversion to this Nero-like way of tying up Christians in the skins of wild beasts that the dogs may devour them. But it will be said, that the dispositions which have been shown to exist in the mind are formed by the mind itself, in the voluntary exercise of its powers; such would not be the case with a disposition existing prior to all action. This is true, but it is not of the least moment in settling the question of the physical? character of the disposition. If a disposition may be produced by the mind itself, which so far from being itself an act makes its existence known only by its influence, and which yet is not incorporated with the substance of our being, nor entitled to the epithet physical, then such a disposition might inhere in the mind prior to all mental action, without possessing a physical character. There is not the least relevancy or force, therefore, in the argument commonly and chiefly relied upon, that if there be such antecedent disposition, it must be physical. The only plausible argument that can be urged here, is, that experience shows us what is the formative law of our disposition, that these are always generated by the minds own action; and it is absurd therefore to suppose that any disposition can exist in the mind anterior to all action. The conclusion to which this argument arrives is wider than the premises. Its fallacy, and it is an obvious one, lies in extending a law, generalized from observation upon the mind’s action, to a case in which by hypothesis the mind has never yet acted, and to which, of course, the law can have no application. There is here a fallacy of the same nature as would be involved in a process of reasoning like this: All our observation proves to us that no tree can be produced but by calling into action the germinative power of its seed. The seed must be planted in a fitting soil, and be subjected to a certain class of influences; it must decay and then send forth the tender shrub, which, in its trunk, must be sustained by appropriate nourishment; and years must elapse before the tree will lift its tall head to the skies. No man has ever seen a tree produced by any other means, and the nature of things is such that a tree cannot be produced in any other way. Therefore, no tree could have originally come into being but through the same process. The error in reasoning is here apparent, nor is it less so in the case which this was intended to illustrate. Here again it will be urged, and at first sight the objection may seem to gather force from the illustration we have just employed, that if there are any such antecedent disposition as we are contending for, formed previous to any action of the mind, it must be the direct effect of creative power; and if it possesses any moral character, and we shall offer some reasons for believing it does, then God is the immediate author of sin. This is the form in which this objection is always put by Mr. Finney and others, and we have therefore adopted it, although it assumes what has been shown to be untrue, that a disposition of mind, in the sense in which we use the term, implies the idea either of a physical entity or a spiritual substance. It does not and cannot include any such idea, and can in no case be considered, therefore, as the effect of creative power. But does it follow that a primitive disposition, such as we speak of, must be the direct product of the agency of the Deity? Is it not evident, in the contrary, that this is only one out of a infinite number of modes in which it may possibly have been produced? The first tree might have been called into being by the power of God, and sprung up in an instant, complete in all its proportions; but it might also have been produced in an endless number of ways, through the operation of some law, different, of course, from the existing law of vegetable production, but requiring as much time for the completion of its process, and removing its final result to any assignable distance from the direct interference of divine agency. So is it possible too, that a primitive disposition of mind may be produced in an infinite number of ways; and the mode of its formation may be such that it cannot be considered the effect of the divine power in any other sense than that in which all the movements and action both of matter and mind throughout the universe, are said to be of God. We think we have now shown that there are such states of mind as have been designated by the term disposition; that a disposition of mind may exist anterior to all mental action; that this disposition does not form any part of the substance of the mind; and that it is not necessary to suppose that God is the author of it, in any other sense than that in which he is the author of all we feel and do. We come now to discuss the question of the moral character of mental disposition. Mr. Finney, with his accustomed violence and lavish abuse of those who teach a different doctrine, denies that a disposition of mind, granting its existence, could possess any moral character. Most of his arguments on this point have been already dispatched by our preliminary discussion. If it is true that a disposition is sinful, then sin is a substance, instead of a quality of action. Then, too, God is the author of sin, and he is an infinite tyrant, since he damns man for being what he made him. This sentence comprises within it the substance of most that wears the semblance of argument in what Mr. Finney has said on this subject; and how perfectly futile this is has been made sufficiently apparent. He argues from the text, ‘Sin is a transgression of the law,’ that sin attaches only to acts, and cannot be predicated of a disposition. As well might he argue from the assertion, man is a creature of sensation, that he possessed no powers of reflection. Until he can show, what indeed he has asserted very dogmatically, but of which he has offered no proof, that this text was meant to be a strict definition of sin, it will not serve his purpose. There is undoubtedly a sense in which it is true, that nothing can be sinful which is not voluntary. And in this sense of the word all our dispositions are voluntary. There are two meanings attached to the word will. It sometimes denotes the single faculty of mind, called will; and sometimes all the active powers of the mind, all its desires, inclinations and affections. This double meaning has proved a great snare to Mr. Finney. He either never made the distinction, or perpetually loses sight of it, and hence is often inconsistent with himself. In seeking to exhibit the meaning which he prevalently attaches to the words will, voluntary, etc., we shall have occasion to present to our readers a very singular theory of morals. Again, in another place, he says, ‘If a man voluntarily places himself under such circumstances as to call wicked emotions into exercise, he is entirely responsible for them. If he places himself under circumstances where virtuous emotions are called forth, he is praiseworthy in the exercise of them, precisely in proportion to his voluntariness in bringing his mind into circumstances to cause their existence.’ Again, he says, ‘If he (a real Christian) has voluntarily placed himself under these circumstances of temptation, he is responsible for these emotions of opposition to God rankling in his heart.’ We might quote pages of similar remarks. These passages would afford ground for comment on Mr. Finney’s philosophy. He shows himself here, as on all occasions when he ventures upon the field of mental science, a perfect novice. But we are chiefly concerned with the theological bearings of the passages quoted. It is evident that Mr. Finney here uses the words will, voluntarily, etc., in their restricted sense; and hence we have the dangerous theory of morals, that nothing can possess a moral character which is not under the control of the volitions of the mind. But our emotions cannot be thus controlled. They rise spontaneously in the mind, they must exist when the thoughts are occupied with the objects appropriate to their production. Hence all our emotions, affections and passions, according to Mr. Finney, possess a moral character only in consequence of the power which the mind has, by an act of will, to change the object of thought, and thus introduce a different class of feelings. Now, we might object to this view of the matter, that the will does not possess the power here attributed to it. Our trains of thought are in some degree subject to our volitions; but the will has by no means an absolute control over the attention of the mind. Attention is generally indeed but another name for the interesting character of the ideas to which the mind is attending, and is no more directly subject therefore to the bidding of the will, than is the state of mind which imparts its interest to the present object of thought. The grounds and the force of this objection will be evident to anyone who will reflect upon states of mind which he has been in, when his whole soul was so absorbed in the contemplation of some subject, that all his efforts to break away from the scenes which riveted his attention, only served to break for a moment their fascinating power. But we will wave this objection, not because it is not sufficiently strong to be fatal to Mr. Finney’s theory, but because it lies aside from our present course. A still more serious objection is, that upon this theory it is impossible that our emotions should possess any moral character. If they are moral, ‘only as they are indirectly bidden into existence by the will,’ then they cannot be moral at all. If it is necessary to go back to the act of will which introduced the object, in view of which these emotions necessarily arise, to find their moral character, then upon no just grounds can morality be predicated of them. If a man has put out his eyes, he cannot justly be accounted guilty for not being able to read, nor for any of the consequences which result from his blindness. These consequences, if he could have foreseen them, do indeed accumulate the greater guilt upon the act of putting out his eyes; but that act is all for which he is fairly responsible. So in the other case, it is upon the act of the will which brought the mind into contact with the objects, which of necessity awakened its emotion, that we must charge all the responsibility. All the virtue and vice, the holiness and sin of which we are capable, must lie solely in the manner of managing the power of attention. He is a perfect man whose mind is so trained that it takes up whatever subject of meditation the will enjoins; and he is a sinful man, whose mind, without a direct volition to that effect, reverts, as if by instinct, to holy themes and heavenly meditations, and adheres to them even though the will should endeavor to force it away. All the foundations of morality and religion are virtually swept away by this theory. If its assumptions are true, we should discard all motives and means now employed to promote virtue. As it makes all moral excellence reside in the readiness and skill with which the power of attention is managed, the most efficient means for the promotion of virtue, beyond all comparison, would be the study of the mathematics. Such are the ridiculous extremes to which Mr. Finney is driven in carrying out his doctrine, that all sin consists in acts. It can hardly be maintained that we have caricatured his doctrine, or run it out beyond it intrinsic tendency. For if, as he says, a man is praiseworthy or blamable in the exercise of his emotions, only because he has placed himself under circumstances where these emotions are called forth, then it is plainly unjust to charge responsibility upon anything else than the act of placing himself under the circumstances. But without charging upon his theory anything beyond what he has developed as its admitted consequences, who does not see upon the face of his own statements absurdity enough to condemn any doctrine which necessarily involves it? A man is responsible for his emotions, he says, only when he has voluntarily brought himself under such circumstances as to call them into existence. Let us suppose then, two men, brought without any direct agency of their own under the same set of circumstances. We will imagine them taken by force and placed in a grog shop, filled with tripplers quaffing the maddening drink, and uttering blasphemies that might make ‘the cheek of darkness pale.’ Emotions are at once awakened in both the spectators. The desires of the one go forth over the scene; he takes pleasure in those who do such things; he longs to drink and curse with them; he knows that this is wrong, and endeavors to change the subject of meditation, but his sympathy with the scene before him is so strong that his thoughts will not be torn away from it, and his mind continues filled with emotions partaking of its hideous character. The heart of the other instantly revolts at the scene. Every time he hears the name of God blasphemed, he thinks of the goodness and glory of the being thus dishonored, and while wondering that others can be blind to his excellency, the liveliest feelings of adoration and gratitude are awakened in his heart. Now, according to Mr. Finney, there is no moral difference between these men; they are not responsible for emotions thus awakened. The one has not sinned, nor is the other praiseworthy. This is no consequence deduced from something else that he has said. It is a case put in strict accordance with his explicit statements. Such is the monstrous absurdity to which he is driven, by denying that the state of mind which would, under the circumstances above supposed, have disposed one of the spectators to descend and mingle in the filth and wickedness of the scene, and the other, to rise from it to heaven in his holy desires and emotions, does of itself possess a moral character. Another illustration of the absurdities in which he has involved himself, is furnished by his declaration, that man is praiseworthy in the exercise of his emotions, ‘precisely in proportion to his voluntariness, in bringing his mind into circumstances to cause their existence.’ Mr. Finney’s common method of expressing the incomprehensibility of anything is by saying, ‘It is all algebra;’ and we must really doubt whether he knows the meaning of the term proportion. For upon his principles, the ration between the merit or the demerit of any two actions whatever, must be a ratio of equality. Voluntariness, in his sense of the word, does not admit of degrees. The will either acts or it does not, to bring the man under the peculiar circumstances. There are no degrees in its consent or refusal; and of course there can be no degrees in moral worth, or in guilt. If two men have each received the same injury, and each by an act of will directed the attention of the mind to the injury and him who committed it, then they are equally guilty for their feelings of hatred, however much those feelings may differ in strength. There can be no difference of degree in the moral demerit of their emotions, although the one should hate his adversary enough to work him some slight injury in return, and the other hate him so much that nothing less than the murder of his victim will satisfy his thirst for vengeance. The two men were equally voluntary in bringing their minds under the circumstances which awaken their emotions, and must of necessity, according to Mr. Finney’s canon of morality, be equally guilty. There is indeed another class of passages in Mr. Finney’s writings, in which he brings forward a further criterion of morality. 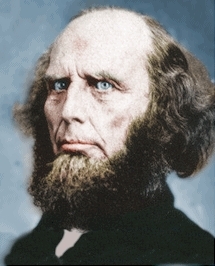 He says, ‘When the will is decided by the voice of conscience, or a regard to right, its decisions are virtuous.’ The change of preference, or the decision of the will, which takes place in regeneration, must be made, ‘because to act thus is right.’ The will must decide ‘to obey God, to serve him, to honor him, and promote his glory, because it is reasonable, and right, and just.’ It is the rightness of the duty that must influence the mind if it would act virtuously.’ And again, ‘When a man is fully determined to obey God, because it is right that he should obey God, I call that principle.’ In these passages, and there are many more like them, he seems to resolve all virtue into rectitude. It is evident why he does so, for he is thus enabled to require a mental decision, and act of the mind, in relation to the rectitude of any emotion or action, in order to constitute it virtuous; and thus defend his position that morality can attach only to acts. He has here fallen into the mistake, however, of making the invariable quality of an action the motive to its performance. It is true that all virtuous actions are right, but it does not follow from this that their rectitude must be the motive to the performance of them. If this is so, then the child, who in all things honors his parent, does not act virtuously unless each act of obedience is preceded by a mental decision that it is right for him to obey. Mr. Finney desired to take ground which would enable him to deny that there is anything of the nature of holiness in the Christian’s emotions of love to God, when prompted by his disposition to love him; but he has evidently assumed an untenable position. We could easily bring forward more errors into which he has been betrayed in carrying out his false doctrine, that morality can be predicated only of acts. But we have surely presented enough. And this exposure renders it unnecessary that we should repeat what have been so often produced and never refuted, the positive arguments for believing that our dispositions, or states of heart, including the original disposition by which we are biassed to evil, possess a moral character, and are the proximate sources of all the good and evil in our conduct. Some of Mr. Finney’s pretended arguments against this opinion we have not answered, simply because they are so puerile, that, though we made the effort, we could not condescend to notice them. All of them that had the least plausibility we have shown to be without any real force. And if any man can reject this opinion on account of the difficulties with which it is still encumbered, and adopt the monstrosities connected with Mr. Finney’s rival doctrine, we must think that he strains at a gnat and swallows a camel. 2 For a full discussion of the Inability of the Sinner, see Biblical Repertory for 1831, p. 360, or Princeton Essays, Series First.